Thomas Wolfe grew up in Asheville, North Carolina but spent many years of his adult life in various hotels and apartments throughout New York City. Tom visited New York City in May 1923 hoping to sell his ten-scene play Welcome to Our City to the Theatre Guild. Months later he was asked to shorten his work to make it more manageable for the stage. Wolfe wrote “You can teach me no balance, equipoise, or moderation. Nothing will be gained by putting a fence around me: I will burst forth the more intemperately at the end.” By early November he was back in New York. He shared an apartment with four University of North Carolina classmates, and worked soliciting funds for the University of North Carolina, still trying to sell his plays to produce on Broadway. In February 1924, in need of money, Wolfe accepted a teaching position in the English department at New York University, Washington Square College. He promised to be a faithful and efficient professor, despite his lack of teaching experience. He moved to a room in the Hotel Albert. He was paid $1,800 for his first seven-month teaching contract and continued teaching for the next seven years. With his initial savings, he left in October 1924 for Europe, the first of seven trips overseas. Returning in August 1924, Tom met patroness Aline Bernstein. Although a married woman, the two soon began a serious relationship, and in January of 1926 the pair moved into a loft at 13 East 8th Street. She encouraged him to work on a novel instead of playwriting and supported him when he was not teaching. In October 1927 they moved into a larger apartment at 263 West 11th Street. Tom, with his teaching salary, insisted on paying for his portion of the expenses. With the first draft of his novel O Lost complete, but yet unpublished, Tom’s relationship with Aline became strained and Wolfe, seeking his freedom, left New York for Europe alone in June 1928. Returning New Year’s Eve 1929, Wolfe moved into an apartment at 27 W. 15th Street. In March 1930, Tom was awarded a Guggenheim Fellowship and planned to travel in Europe for the next year to complete writing a second novel. The following March, Tom moved to 40 Verandah Place in Brooklyn to provide a further separation from Aline, who lived in Manhattan. Tom resided in Brooklyn until September 1935 when he moved to 865 First Avenue in Midtown. In 1937, he gave up this address and lived in various hotels throughout the city until moving October 1937 into room 829 at the Hotel Chelsea. Tom lived in this three room corner suite until leaving in May 1938 for a speaking engagement at Purdue University and then continued on a westward journey. While on this trip, Tom became ill in Seattle. After a month without improvement, the doctors sent him to Johns Hopkins Hospital in Baltimore, MD. Tom died of tubercular meningitis on Sept. 15, 1938 at the hospital. Between 1924 and 1938, Tom resided in numerous hotels and apartments throughout New York City, including four in Brooklyn. 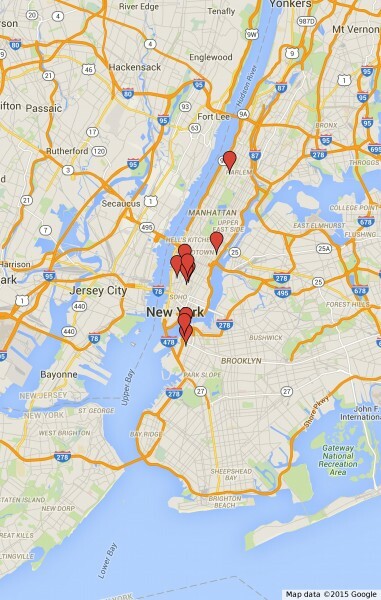 The map below shows the apartments and two hotels where Tom lived during his almost fifteen years in New York City. Click on the markers to learn more about his time at each location.